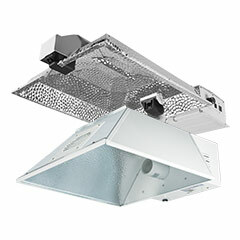 Our Grow Light Hoods are divided into 2 categories; Air coolable reflector hoods and non-air cooled open air hoods. 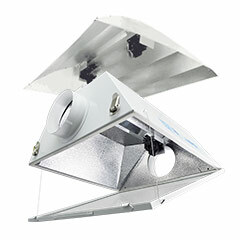 Air cooled reflector hoods include glass shields and built in fittings to connect to ductwork for air cooling and include XXXL types Cool Tubes and many different shapes and sizes. 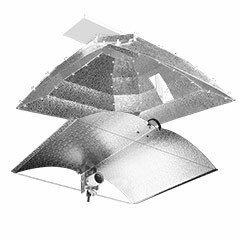 Air cooled reflector products enable growers to route external air through the hood to cool the light out the room without affecting CO2 or other environmental impacts. This allows for very creative ventilation strategies as well. 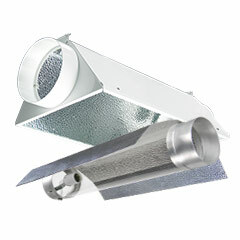 Non-Air cooled hoods include Wing and Umbrella styles.